May 16, 2018 (San Diego) - The Registrar of Voters is asking mail ballot voters to check their mail ballot packets for the June 5 Gubernatorial Primary Election. His office has received about a dozen reports of missing mail ballots in the election packets. October 1, 2016 (San Diego) - The Registrar of Voters is urging voters to double-check their registration status on its website after some residents got letters from an organization called the Voter Participation Center claiming the residents aren’t registered to vote. The organization’s letters offer a pre-filled voter registration form that may include incorrect or outdated information or information for persons who don’t live at the address. The letters are causing some confusion because in many instances, the voter is properly registered to vote. November 11, 2014 (San Diego’s East County)- Cajon Valley, Lakeside, Lemon Grove, and Ramona’s school districts all had school bond measures on the ballot. Each bond measure needed 55% of the votes to pass. Lemon Grove’s school bond passed by a healthy margin. Lakeside’s school bond narrowly won approval. Cajon Valley and Ramona’s bonds appear to have failed by slim margins, though the Registrar of voters still has about 28,000 absentee and provisional ballots countywide left to count. Below are details. October 28, 2014 (San Diego’s East County) – If you haven’t yet sent in your mail-in ballot, you don’t have to drive to the Registrar of Voters to assure it’s received by the November 4th election. Now you can drop your mail-in ballot off at 12 county libraries during their business hours through November 3rd, the day before the election. That includes the El Cajon and Santee libraries in East County. September 2, 2014 (San Diego's East County) - The ballot box may soon be a relic of the past for voters in special elections. A bill on the Governor’s desk would allow the Registrar of Voters to conduct all special elections entirely by mail. San Diego has had many special elections in recent years, including mayor, city council, state legislature and Congress. May 28, 2014 (San Diego)--The Gubernatorial Primary Election is Tuesday, June 3 and the Registrar of Voters still needs 150 poll workers throughout the County. 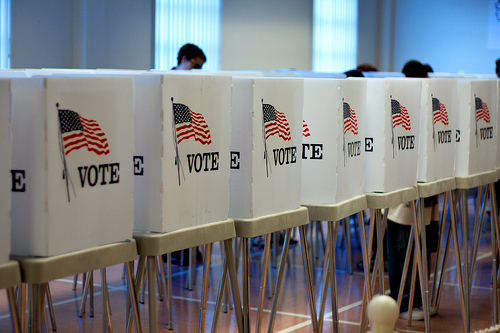 May 27, 2014 (San Diego)--Tuesday, May 27th is the deadline to request a mail-in ballot for the June 3rd election. You can download an application from the Registrar of Voters site and e-mail or fax it in. Your request must include your name, registered address and date of the election, the address where your ballot should be mailed, and your signature. You can email your request to ROVmail@sdcounty.ca.gov.